In attempting to write an introduction to this document, I find myself at a loss. How do I explain this? Perhaps the summary is best left at: "I wanted a cool robot dog." Through my hard work, I feel I have discovered something very important - actual dogs were the best all along. Every revision has used an MMP5, a robot platform from themachinelab.com. Now much of it is inside that chassis, based around a NanoPC-T4. The Kinect (V1) is glued on top, and an SMA antenna jack is mounted behind it where the antenna pokes up like a tail. 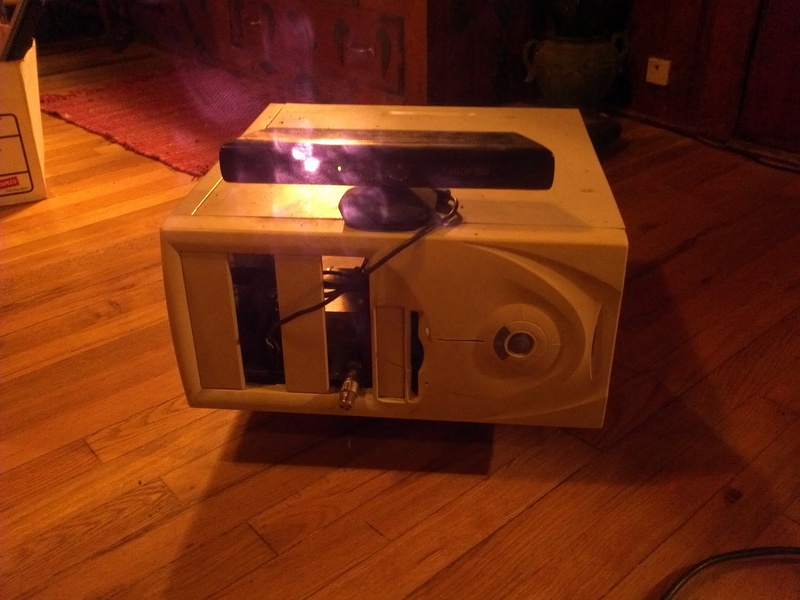 The earlier hardware was based around a case-mod. Directly on top of the robot platform was a desktop case containing much of the electronics. It had a power supply meant for a car dashboard PC and a separate power supply for the robot platform, both running off a large 24 volt LiFePo4 battery. The motherboard was a low-power mini-ITX Intel Atom board. There were two USB peripherals, a first generation Microsoft Kinect and an Arduino handling mostly motor control. One thing I plan to study at length is human/robot interaction. The first hardware revision was based around a netbook, a robot I called alice, and people's first impression was very favorable. I felt I needed the extra computational power of a desktop I had at the time compared to what alice used, my then-failing netbook. I have since realized the computational power of the netbook would have been fine for my purposes, as the actual AI software runs over the LAN on my desktop, aside from the netbook being in bad shape. Now I am on the third revision, cuter than the case-mod, but still not quite as cute at the initial "alice" revision. There is other hardware involved, in fact four computers total. The bulk of the work is done by my desktop, a unix-type system. At the time of this writing, the computer that's actually on the robot is running Alpine Linux. The setup uses a lot of 9P protocol components which are distributed among the four computers. This is the best part. Deep learning algorithms are based on neuroscience. The simplest example, perhaps, is three-layer linear back-propagation, as shown below. You can extend this with more layers, different types of nodes and interconnections, loopbacks, different types of inputs and outputs, etc. The inputs can be pictures, text, audio, whatever... the outputs are typically threshholded "bits" which can be high or low, more like analog than digital. If you desire these algorithms to do something, they have to be "trained" which is simply showing it examples of different inputs and adjusting everything by looking at the error on the outputs from what you wanted. From there, mathematically it's as simple as the math of an idealized ball rolling down a hill, but in the N dimensional "data space" of all the input nodes in fact as "dimensions" in the "space" of all possible inputs. I had to modify libfann, which is already starting to show its outdatedness. I added leaky rectifying linear units, at this point a relatively new type of activation function found to work well for artificial neural networks, or ANNs. I thought about going through the process of adding GPU support, but I have not even begun to at this point. I'm finding it works pretty well without parallelization at all on my i5 desktop. 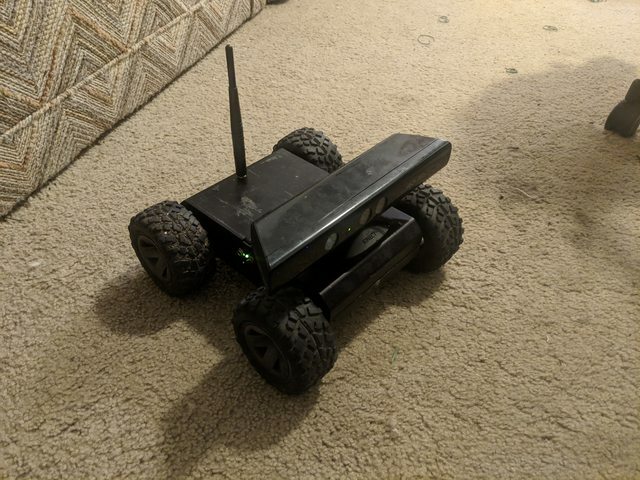 If I run everything on the robot itself it's pretty slow, but this is possible if I wanted to take it away from network connectivity. I had bad luck with libfann's openmp support. The training algorithms are somehow different than a simple fann_train(). The network I started with has 64,000 units arranged in five layers. There are 60,000 input units, three hidden layers of 1,000 units each, and a 1,000 unit output layer. This is my third attempt at a libfann-based driver AI for the hEather robot. All three are online at https://github.com/echoline/fanny. For this attempt I thought a lot about design before getting started. This is a recurrent ANN, meaning I put some output back in as input. I thought about the nature of a mind in the creation of this ANN. One thing the mind constantly does is predict not only the immediate future, but the present moment itself. Thus, 36,000 inputs are the last ten inputs from the camera. I do not use the camera input directly but instead "convolve" with greater detail towards the center, and predict and measure the error from the current frame instead of using it as input. There are six output "bins". 600 output neurons are devoted to minimizing the error of the present moment based on the last ten frames of input. The AI minimizes on the output bin it most closely matches. This error I call "surprise," as it is the error of the robot's prediction of the current moment. As the surprise drops, another variable, which I called "fidget" rises. This roughly describes the robot's perception of the environment. 100 output units are dedicated as "motor neurons." In my design plan, these train on actually the standard deviation and average across all 100 units. In practice, I made a mistake in the math for this; I have no idea why it works so well, and only with libfann. The motor outputs are arranged as well into 5 bins, 20 units apiece. The robot has 5 behaviors, tilt up, tilt down, left, right, and forward. If any output bin is greater than all the others combined, the robot performs the given action. Also worth mentioning are a couple other things I tried in this program. Some output neurons during training are "held" at the value they just outputted. So while everything else minimizes on some other kind of error, these output neurons minimize to their last value, holding somewhat constant at whatever error from 0 they have accumulated. I feed in a few other variables, including one hidden layer in its entirety, the input from the kinect's accelerometer, and all of the last 10 outputs. This is the part that gathers the input, from a Kinect. It's a 9P fileserver which wraps libfreenect into a filesystem API, for Linux or anything that supports the Plan 9 protocol. Source is available here. This is a pretty standard approach to 9P/Plan9. At some point, to a scripter, it just becomes obvious this is how you use "Plan 9," because it cannot really do anything yet. At the same time, it is only the most quality systems research platform out there, at least among those still in any sort of use I've heard of. It ends up having a place as the most beautiful "systems glue" I've ever encountered. After compilation, which requires libjpeg, libixp, and libfreenect, kinectfs takes a single argument, an address in the form tcp!ip!port or unix!/path to listen on. After it's running, you can mount it with anything that can mount 9P. I like to use ixpc, included with libixp, or 9mount. One can mount 9P fileservers from Linux as well. On opening any of the .pnm or .jpg files, the software uses the Kinect to take a picture, and reading the opened file gets the image data of the snapshot. Reading and writing from the files tilt and led get and set status information for the tilt servo and LED on the Kinect. Writing valid integers to color.pnm and depth.pnm set the image formats for the color camera and depth camera respectively. I make use of the openssl program as well for encrypted sockets between the computers. On Plan 9 I use the scriptable equivalents of the openssl binary. This part really doesn't work well on Linux, as Alpine has trouble booting up openssl in a script in the background. I'm afraid Linux hasn't been scripter-friendly for a long time now. All in all, it works surprisingly well. It's exciting and a bit frightening to think, at this point in history there are probably computers powerful enough to simulate a human in real-time. Both the technology and understanding of neuroscience are making rapid process. I think within a few short years, some major philosophical questions will be answered. With these machines that learn from input, I feel we must consider impact before benefit. Robots so far have been the perfect workers, but if they don't want to be "slaves" we will have to take this into consideration at some point. One can also easily imagine robotic gestapo! In the end, no one will know if robots are really thinking with strong AI until there is one with enough computational power and good enough programming that we can just discuss these philosophical issues with it. A human being on average has about 86,000,000,000 brain cells. From the looks of it, a short while after we will be able to simulate that many, we will be able to simulate a thousand times as many. To me, this clearly shows we have a responsibility to teach the right things to such an advanced algorithm. I worry though, as meanwhile the public continues to doubt it is possible at all, laymen continue having the misconception that computers can't write poetry, and programmers continue leaving poetry out of their input data.